Two of my first vegetarian recipe books were the prolific Rose Elliots Beanfeast and The Bean Book. Their titles encapsulated the importance of beans in vegetarian and vegan cuisine. However, it was only when I read Ken Albalas Beans: a History that I came to appreciate their significance to so many cultures and civilisations. Beans: a History is not a recipe book, vegetarian or otherwise. Although it contains around fifty recipes they are included for historical interest, rather than for culinary purposes, as few of them specify quantities or preparation times. Rather, as the title suggests, the book describes the cultural and gastronomic significance of beans from their earliest recorded use to the present day. Most Western societies have traditionally regarded beans as a food of the poor, suitable only for rustic labourers able to digest their tough, fibrous skins and unperturbed by the noisy side effects of dried beans. As the song goes, Beans, beans, theyre good for your heart  the more you eat the more you f**t. However, times and attitudes change, and the ubiquitous soy bean has now become an integral part of modern European and North American diets in its many guises, whilst the UK has the highest per capita consumption of baked beans in the world. Meanwhile, countries such as China and India have embraced beans enthusiastically for centuries and show no sign of losing interest. Author Ken Albala, Professor of History at the University of the Pacific in Stockton, California, has researched his subject meticulously. To truly understand beans, to become one with my subject, I resolved to eat beans every single day, ideally a new species or variety with every meal. The fact that he maintained this diet for about a year demonstrates not only extraordinary commitment but also the incredible diversity and variety within the Fabaceae family, which includes nearly 19,000 species. Many of these, including plants as diverse as peanuts (not a nut! ), garden peas, chickpeas, lentils, broad beans, carob and fenugreek are used as food. 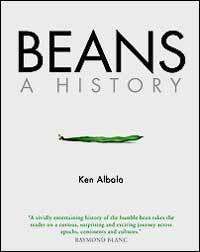 It might be overstating the case to claim that beans saved civilisation, as the writer Umberto Eco has done, but Ken Albala is undoubtedly correct in saying that the cultivation of beans has been crucial to the development of civilisation: as a source of protein, as cattle fodder and as a means of replenishing nitrogen in the soil. As such, the future of beans seems assured, and indeed their uses may well extend to non-food items such as fuels and building materials. With their variety, versatility and virtual indestructibility in dried form, beans are likely to form an essential part of the human diet for generations to come. Beans: a History is scholarly but surprisingly readable and full of fascinating detail. However, at roughly 250 pages of rather small print the book is hard going at times, and it is unlikely to appeal to a wide audience: this is not a book for the coffee table or the kitchen. A major drawback is the absence of illustrations. Beans might not be the most photogenic of foods, but some photographs or line drawings would have broken up the monotony of the text and helped the reader appreciate the different varieties of bean. Nevertheless, Beans: a History would make a valuable addition to the bookshelf of anyone hungry to know the cultural and gastronomic history of the food on their plate.